1Center for Hematology-Oncology of Southern Michigan, Jackson, Michigan, USA. 2University of Michigan Medical School, Ann Arbor, Michigan, USA. J Clin Invest. 2007;117(4):840–840. https://doi.org/10.1172/JCI31978. Barron H Lerner. The Johns Hopkins University Press. Baltimore, Maryland, USA. 2006. 352352 pp. pp. $25.00 ISBN: 978-0-8018-8462-7 (hardcover). 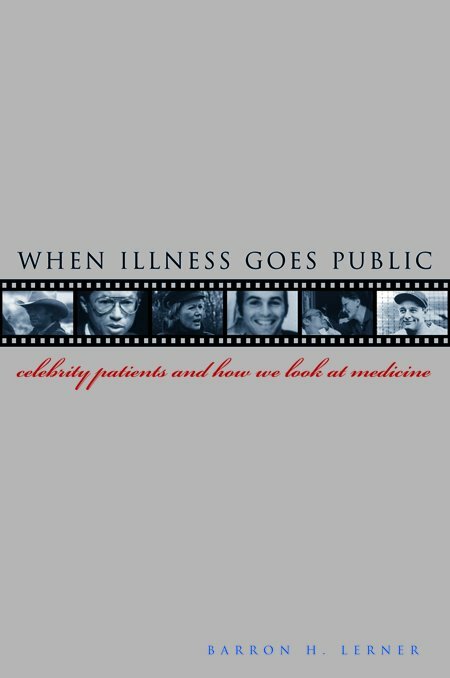 In When illness goes public: celebrity patients and how we look at medicine, Barron H. Lerner, a physician, medical ethicist, and historian, has investigated the change during the last 70 years in how we in the United States view illnesses contracted by famous individuals as well as persons who became celebrities as a result of illness and subsequent treatment. Drawing from media reports, newspapers, newsreels, movies, autobiographies, biographies, and scholarly collections of individual’s papers in addition to his own interviews with both family and friends of his subjects, Lerner offers a superb volume rich with thorough and entertaining recollections and other information not previously in the public domain. Lerner continues, “A crucial part of disease activism is the ability to obtain research funding from the government. So is the ability to raise private money to establish disease-specific foundations. And the best way to obtain both types of funding is to have a celebrity face associated with the disease.” After conventional therapy for lung cancer failed, Steve McQueen sought alternative, unorthodox cancer treatments — in doing so projecting an image of a man actively fighting cancer. Princess Yasmin Aga Khan, daughter of Rita Hayworth, publicized Alzheimer disease and raised money for further research, in part to deal with her anger over her mother’s delayed diagnosis. Both Elizabeth Glaser and Arthur Ashe hid their AIDS diagnoses to avoid stigmatizing their families, but both eventually publicly announced their illness to preempt media disclosure. Both became “moral beacons,” establishing private foundations and garnering public funding for improved treatment. An interesting caveat raised in the book is that while a celebrity lobbying Congress can often secure greater NIH appropriations for disease-specific research, this often reduces the amount of research funding available for other diseases, particularly those lacking a celebrity face, particularly in a time when the total NIH budget is not increasing. In contrast to those individuals mentioned above, some we have come to know were unknown private citizens until their illnesses became public. Barney Clark’s receipt of the first artificial heart incited a public debate about experimentation with new technologies. Libby Zion’s death sparked her father’s angry, passionate reform campaign resulting in graduate medical education changes limiting working hours of house officers and requiring attending physician supervision. In the current scientific community, randomized trials and metaanalyses are the gold standard for therapeutic interventions. But for an individual patient, the bell-shaped curve can be interpreted in many different ways to support the patient’s treatment choices. Lerner clearly shows that both patients and physicians must be aware that inspiring stories of an individual patient may not be universally applicable and as such we must continue working with a system that values scientific inquiry and experimentation governed by informed consent, institutional review boards, FDA review and approval, and adherence to ethical standards. Conversely, the scientific community needs to appreciate that individual cases may provide insights that result in scientific progress. When illness goes public is a clear, concise, and captivating treatise that holds the interest of lay readers and yet illuminates for medical professionals issues that are important to the individual patient as well as the scientific community.